Larval host plants include the shrubs or small trees of Capparis canescens, Capparis mitchellii and Capparis sepiaria. Mature larvae 28 mm long, body dull green with yellow spots; head yellowish green with tiny yellow spots. 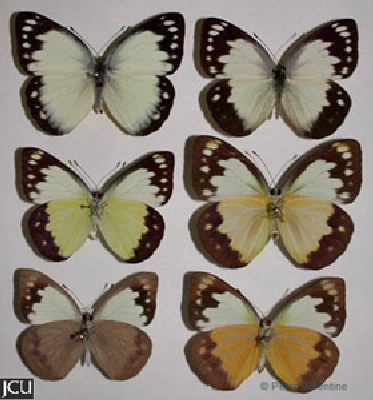 Adults are white with grey and a marginal black band enclosing white spots; lower surface white with dark brown band, basic colour of the hind wing is yellow to orange.